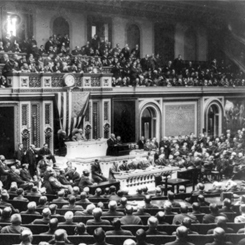 Image courtesy of Library of Congress Featured in this 1916 image, President Woodrow Wilson resumed the tradition of delivering the annual message to a Joint Session of Congress. On this date, President John Adams delivered his fourth annual message to a Joint Session of the 5th Congress (1799–1801) in the new Capitol building in Washington, D.C. Adams discussed the mid-Congress move of the federal government from Philadelphia and applauded the smooth transition to a capital city still under construction. “I congratulate the people of the United States on the assembling of Congress at the permanent seat of their Government, and I congratulate you, gentlemen, on the prospect of a residence not to be changed. Although there is cause to apprehend that accommodations are not now so complete as might be wished, yet there is great reason to believe that this inconvenience will cease with the present session.” Adams’s address also had the historical distinction of being the last presidential message delivered in person to Congress until Woodrow Wilson in 1913. Adams’s successor, Thomas Jefferson, believed the tradition to be too monarchical in nature and subsequent Presidents followed Jefferson’s example. A topic covered in Tina Tate’s oral history, the State of the Union Address has a long and rich history.